Questioned by the umpires, Nigel Llong and Richard Illingworth, he maintained it was only a cleaning cloth being applied to the ball. The 25-year-old, in his eighth Test, later described that blatant lie as a product of panic at realising he had been caught. “I have been charged with attempting to change the condition of the ball,” the opener said before admitting his guilt and detailing what he had been up to. “We had a discussion during the break and I saw an opportunity to use some tape, get some granules from rough patches on the wicket to change the ball condition. It didn’t work.” Too right it didn’t. “I’m not naming names, but the leadership group talked about it and Bangers (Bancroft) was around at the time. We spoke about it and thought it was a possible way to get an advantage,” he said. 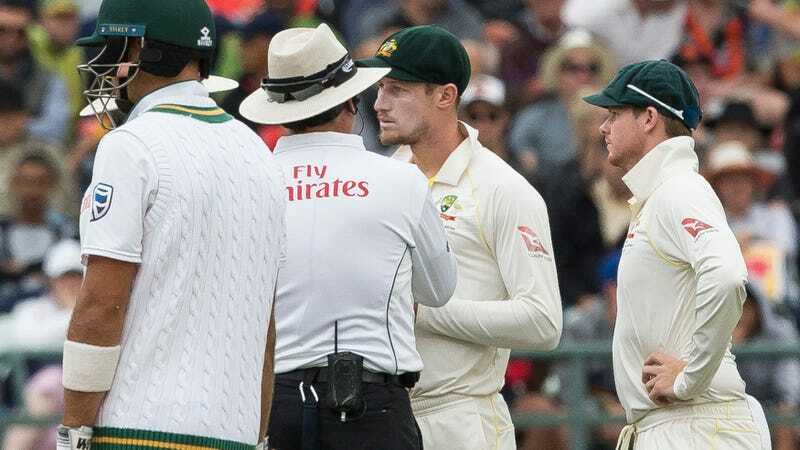 “Following discussions with Steve Smith and David Warner they have agreed to stand down as Captain and Vice-Captain respectively for the remainder of this Test match.